McAdams Floral was started in 1975 at 1107 East Red River by Joe McAdams, an experienced floral designer for more than 25 years. The original building was designed by his son, Dennis. A large greenhouse was added in 1976 and the shop has also undergone major expansions in both the display and design areas. 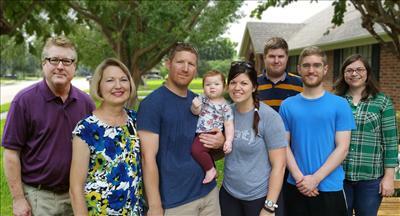 McAdams Floral is a full-service flower shop with the emphasis on "service." The staff at McAdams Floral will strive to make every event in your life a special occasion. McAdams Floral carries a large selection of fresh flowers, including Holland and tropicals. They have an on-site greenhouse to supply you with beautiful blooming and foliage plants including European gardens and custom plant baskets. We also create memorable gift baskets with champagne, wine, beer and candy, along with many gourmet and snack items. Other accessories include balloons, plush animals, permanent silk flowers to enhance your decor, and several lines of giftware. A fleet of five radio-equipped vans is available for city-wide delivery. Worldwide delivery is available through numerous wire services such as Teleflora and FTD. Today, 40 years later, Joe McAdams' daughter and son-in-law are carrying on the family floral tradition with his original philosophy: "Our customers are our number one priority, and their business is always appreciated." We think "Mr. Mac" would be proud! The shop is open from 8 a.m. to 5:30 p.m., Monday through Friday, and 8 a.m. to 3:00 p.m. on Saturday. All major credit cards are accepted. 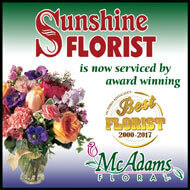 • McAdams Floral was voted by Victoria to be the "Best of the Best" florist in the Victoria Advocate poll. 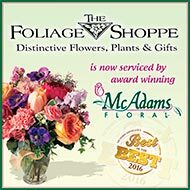 • The Society of American Florists (SAF) recognized McAdams Floral as a Valued Member. This prestigious award is presented to member shops with the energy and creativity vital to shaping the floral industry. • McAdams Floral was named TeleFlora's "Top 250" Order Sending Shops in the United States. This honor is given in recognition of the florist's contribution to TeleFlora, the world's largest floral wire service. • Member of the Mid Coast Allied Association in which McAdams Floral held the office of Treasurer for 2 years and President for 2 years.